1. How many women end up winning? As we wrote yesterday, female candidates are playing a starring role in Tuesday’s races — from Stacey Abrams vs. Stacey Evans in Georgia’s Democratic gubernatorial primary, to Lizzie Fletcher vs. Laura Moser in TX-7 and Amy McGrath vs. Jim Gray in KY-6. 2. 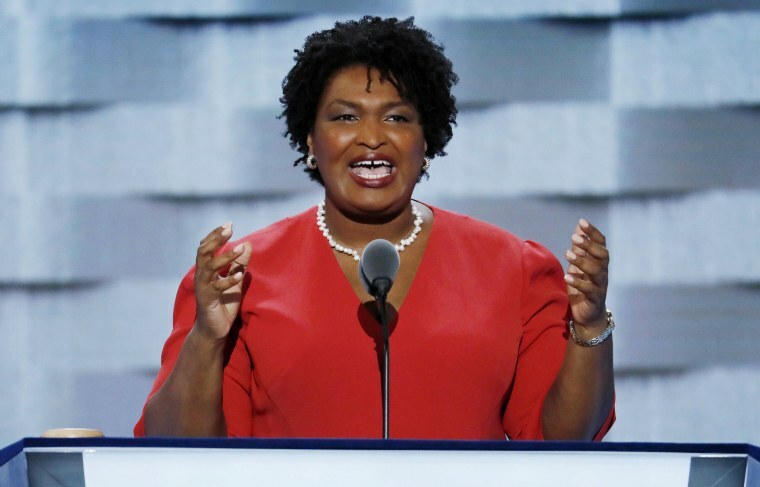 How strong do Democrats look in Georgia? It’s going to be fascinating to compare the Democratic vs. Republican vote totals from tonight’s competitive gubernatorial primaries in Georgia — just to get a read on the Democrats’ chances here in the fall. By the way, if no Republican in the crowded GOP field surpasses 50 percent, the Top 2 head to a runoff that’s TWO MONTHS from now on July 24. The GOP frontrunners are Lt. Gov. Casey Cagle and Secretary of State Brian Kemp. 3. Do Houston-area Democrats go for the establishment choice or the progressive? So far, last week’s result out of NE-2 — where progressive Kara Eastman upset the establishment-backed Brad Ashford – has been the exception rather than the rule. But it could start looking like a trend if progressive Laura Moser upsets the Dem establishment’s preferred candidate in Lizzie Fletcher in the TX-7 runoff. But as the Texas Tribune’s Abby Livingston has observed, this runoff has become a bit boring, with ideology and national politics taking a backseat to local issues. 4. Does the pro-Bernie Sanders group Our Revolution continue to lose more races? Speaking of Moser, the pro-Bernie Sanders group Our Revolution has endorsed her, as well as Rick Trevino, who’s the underdog to Gina Ortiz Jones in today’s TX-23 runoff. But as Politico has written, the group is in disarray and it can’t claim any 2018 victories as its own (although the group has Stacey Abrams in Georgia, but so do almost all other national Dem groups). 5. Who wins out in the increasingly competitive KY-6 race? In today’s Dem primary to challenge vulnerable Rep. Andy Barr, R-Ky., Lexington Mayor Jim Gray faces off against retired Marine Lt. Col. Amy McGrath. The contest has turned negative after Gray aired a negative TV ad against McGrath, highlighting how she recently moved to the district. In the 2016 election, Donald Trump made two arguments: 1) Hillary Clinton’s personal email server put U.S. security at risk, and 2) he was the person who was going to drain Washington’s “swamp.” Well, two stories released yesterday undermine the thrust of those Trump arguments. Indeed, check out this tweet from Sen. Marco Rubio, R-Fla.: “#China is winning the negotiations. Their concessions are things they planned to do anyways. In exchange they get no tariffs, can keep stealing intellectual property & can keep blocking our companies while they invest in the U.S. without limits. #Losing.” Whoa. In case you missed them, here are the recent developments in the 2018 midterms that we’ve chronicled on our “Rundown” blog: Female candidates will play as starring role in tonight’s primary and runoff contests… Per NBC’s Ali Vitali, Don Blankenship announced a third-party Senate bid in West Virginia (but that flies in the face of the state’s “sore loser” statute barring candidates from running again)… We now know who funded those anti-Blankenship TV ads… A Dem Super PAC is trying to help Bill Nelson in Florida with a new $2.2 million ad buy… And in CA GOV, Gavin Newsom is hitting his fellow Democrat in a new TV ad.